The embankment at the Morse Boulevard Bridge, mosquitoes and parking at the Fenney Putt & Play facility dominated a special question-and-answer session Thursday evening hosted by the Project Wide Advisory Committee. Resident Michael Schobinger was very direct in his questions about the status of the embankment. “My first concern is why the PWAC has not explored the failure of the bridge and why it is failing. The bridge is not that old and if it is failing, why is it failing?” Schobinger asked. He asked why the business district at Sumter Landing isn’t being looked to for a great contribution for the revetment project, which is on hold at the moment. “Just dump some rip rap in it,” he said. District officials said it’s not as simple as that, because as a unit of government the work will require state and federal permits. There will have to be a solid engineering plan in place in order for the proper permits to be secured. Luke Courtemanche, of the Village of Haciendas of Mission Hills, called on PWAC to not spend money at the embankment and to force Sumter County to contribute to the work. “I would ask that we don’t spend another dollar,” he said. Phillip Wenzel, of the Village of Winifred, who said he has studied the original construction documents, asked some pointed questions and admitted he was beating a dead horse. “There was a failure, but we’re way past that,” he said. Mary Ann Taylor, of the Village of Pennecamp, lives on Horizon Run and raised concerns about “a swamp” in her neighborhood. Taylor said she is worried about mosquitoes, a hot-button issue in The Villages since a Villager’s death in January from West Nile Virus. “I don’t want that kind of environment near our homes,” she said. Another resident urged building birdhouses and bat houses to combat the mosquito problem. 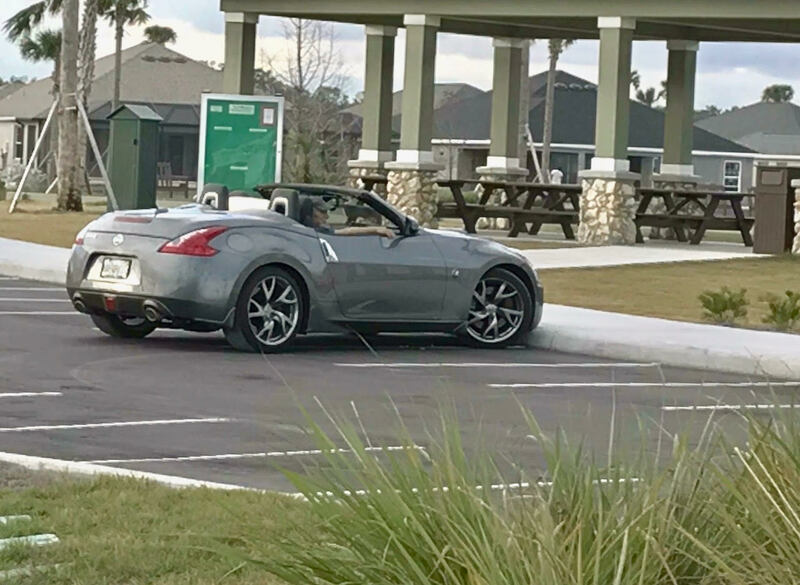 Villager Tom Brigham said the parking at the Fenney Putt & Play is woefully inadequate for residents who have to drive their cars to that part of The Villages, which does not yet have golf cart access. “It needs automobile parking,” Brigham said. He was told that parking for automobiles is available at the Sugar Cane Recreation Center and golfers can walk to the Putt & Play facility. A car parking in golf cart parking at Fenney Putt & Play. Brigham described himself as “healthy,” but said it’s still a hike for someone of his ability. He also noted that residents who live near the Putt & Play are putting up “No Parking” signs. “Before we buy that amenity, we ought to make sure they put in some automobile parking,” Brigham said. PWAC Chairman Peter Moeller encouraged residents to attend regular PWAC board meetings. The next one is set for 8:30 a.m. Monday, March 11 at the District Office at Lake Sumter Landing.